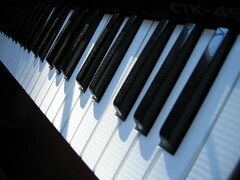 The piano is perhaps one of the most beautiful sounding instruments in the world. It can make you want to dance out of your seat, or cry for someone you’ve lost. Learning to play with versatile sounding instrument takes time and practice. It starts by finding the right teacher, then the right instrument. Most instructors, no matter if they are private or through a school will require the student have their own instrument to practice on outside of their lessons. A long time ago, pianos were owned by a lot of different people. Now, the electric piano keyboard stands in for the large piece of musical furniture. Finding the right keyboard can take some time. There are a few things that need to be considered before a purchase can be made. First and foremost, the student, or the parents, if the student is a child, will need to decide on the best place to house the instrument. It is advised that the practice space remain constant to keep the student focused on the tasks that will be assigned to him or her. Seating is equally important. If the the student is to practice for one hour, they need to be comfortable. Choose seating that will support the spine, and allow them to be able to sit without aches and pains. Now that the practice area is set up, the keyboard of choice can be brought home. It is also ideal to make sure that there are headphones. This will allow the student to practice without disturbing other family members in the household. These are especially useful if the practice area happens to be in the family common area. That’s all there is to it. The student is now ready to take on learning this fascinating instrument in the comfort of his or her own home on their own instrument.